PRP or Platelet-rich plasma is a viable treatment in different medicinal and surgical fields for SKIN REJUVENATION. Also, the use of Platelet Rich Plasma for facial procedures is used to achieve great results without the use of chemicals and within the shortest time possible. Platelet Rich Plasma is viewed as a generally safe option for any individual who wants a smoother, firmer skin on their neck, jawline, or face. What are the benefits of the PRP Treatment for skin rejuvenation in Edmonton? Can I get an instant result after the PRP procedure for skin rejuvenation in Edmonton? Platelet Rich Plasma for facial revitalization requires taking a little amount of blood, which is placed in a centrifuge. After spinning, the platelets (containing growth factors) and then infused into parts of the patient’s face or neck. After injecting the PRP, you will instantly see a firmer and smoother skin at the targeted area. The whole procedure can be completed in just one visit with practically no downtime. What are the growth factors in PRP for skin rejuventation in Edmonton? Platelets release several bioactive proteins in control of mesenchymal stem cells, osteoblasts, and chemoattraction of macrophages. Platelet-rich plasma is basically blood plasma with concentrated platelets and different growth factors. The platelets are the most critical aspect of the treatment because platelets contain signaling proteins, bioactive proteins, and growth factors. The bioactive proteins help regenerate and repair the tissue while the signaling proteins bring the stem cells to the targeted area territory to aid the recovery of the facial and neck tissues. The growth factor in the Platelet-rich plasma activates body cells to prepare for healing and generation of collagen. A little vial of blood is drawn from the patient’s arm – not as much as that drawn for blood tests. The drawn blood is placed in a centrifuge in order to separate the plasma and red blood cells. The procedure concentrates the count to around 4 times the normal platelet concentration. The concentrated platelet-rich plasma or liquid gold is then infused into the targeted area. The addition of basic calcium chloride activates the platelet-rich plasma, which acts in a similar way the body would react if there is real damage. For nasolabial folds – A fanning technique or the linear threading is used for injection. The entire needle is brought into the nasolabial fold (exactly at the center), and PRP was infused gently by withdrawing the needle. For forehead and crow feet – PRP is injected intradermally in all areas by making use of a serial puncture method. For glabellar wrinkles – a linear threading technique is used to inject the platelet-rich plasma. Lower eyelid – subdermal injections are required (0.2ml per injection), which is spaced 1cm apart. Cheeks – linear threading' technique is used and the solution is injected subdermally and intradermally ((0.2ml per injection). Chin – linear threading technique is used (0.2ml per injection). What is the recommended number of treatments? You will notice visible results in one treatment; nonetheless, for best results, you can undergo 2 to 3 procedures, which is spaced 2 months apart. 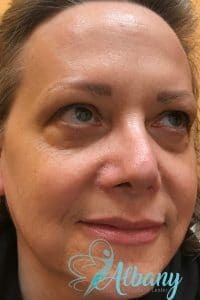 What can I do before the treatment? Drink a lot of fluids and make sure you don’t have any infectious disease like cold or flu. Do not use oil supplements, steroids, Aspirin, Ibuprofen, or Motrin for at least three to seven weeks before the procedure. Platelet Rich Plasma treatments are minimally invasive and the recovery time is little. Nevertheless, you may notice bruising, tenderness and redness after the treatment, which disappears on the second or third day. A few patients may encounter some swelling, nonetheless, this will lessen within 1 to two days. Despite the fact that this procedure can have minor reactions after the treatment, most times, these are minor side effects. Furthermore, a lot of people return to their normal activities after their procedure. Using PRP for facial and neck rejuvenation is another way to fight the signs of aging naturally – it is an effective and safe treatment. 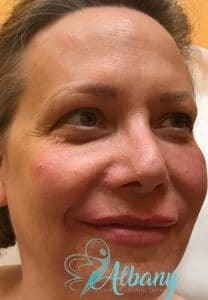 Presently, a lot of people are using platelet-rich plasma for facial rejuvenation since it is a very viable treatment with little or no side effect. It gives both long-term and short-term results, as long as the body keeps absorbing its growth factors and uses them to create new and healthy tissue. Within a day, you can experience dramatic results that will last a long time. Additionally, the procedure is much more affordable than invasive and surgeries procedures. What’s more, you don’t require any aftercare and you can go come back to work quickly. The advantages of using platelet-rich plasma are numerous and the dangers are few, which makes it the perfect choice for people who want to rejuvenate their face and neck. About Dr. Kamal Alahllak, the author: Dr. Alhallak is the medical director of Albany Cosmetic and Laser Center. He has Ph.D. in Pharmacy and Pharmaceutical Sciences received special training in cosmetic injections such as Botox, fillers, lip fillers, facelift, cheek augmentation and more. He approval rating is one of the highest in Alberta. Albany cosmetic and Laser Center is the most advanced cosmetic and laser centers in Edmonton, we offer a complete portfolio of none-surgical cosmetic and aesthetic procedure as has Fraxel laser for skin tightening and wrinkles removal, Spectra Laser for pigmentation and tattoo removal, Elite plus dual wavelength for Laser hair removal and spider veins. We also offer body shaping for fat removal and fat reduction such as love handles and arm slimming.